Here is a story of a girl who doesn’t want to keep her farm alone under bad circumstances when she finds out her father lied about how he got the money to buy their farm. She sends a letter to the family that her father cheated and when they come she learns even more than she knew. I really loved the way this story unfolded. I loved the main characters and how they were described. This flowed so nicely and I had a hard time putting this book down. I received this book from Tyndale publishing for a fair and honest opinion. This started out fast and good and just kept getting better. It was a great romantic suspense novel. I really liked the main characters and did not want certain people to be the bad guys. I look forward to reading more of Sandra’s book. 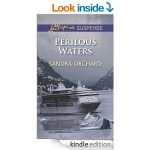 I received this book from Sandra Orchard for a fair and honest opinion. This was a good edition to the Isaac Bell series. I enjoyed reading this story about bootleggers. As always could use a little more of Marion in the book. It had a lot of action. I really enjoyed this story. Kind of miss having more of Hamish in his head but know that he is getting better. This had a great story and a few twists and turns. This book showed what could happen when a person who was raised to never raise a finger to work can actually accomplish once they really try. She does not want to have other people have other people tell her what she can and can’t do. I look forward to each of her other books. I received this book through the book club network for a fair and honest opinion. This was the first book that I have read by Lisa Unger and it will not be my last. This had so much action and lots of twists and turns. I look forward to reading more of her stories. This was a great read. Lisa put the present and the past together very well. Sometimes it just doesn’t work, but this was done perfectly. I had not read too many of her books before but I will read as many as I can now. I received this book from the bookclub network for a fair and honest review.